There has been an explosion of both the incidence and medical knowledge of viral hepatitis over the last two decades. Not only is the incidence of infection and disease increasing, but new hepatitis viruses have been discovered, as well as the launch of new pharmaceutical products. 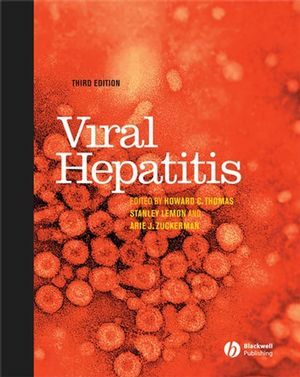 Previously published by Churchill Livingstone, Viral Hepatitis by Zuckerman & Thomas was the first comprehensive book on hepatitis and is recognized as the standard reference text in this field. The new third edition, now published by Blackwell Publishing, addresses the recent advances in diagnosis and treatment with entirely revised and current topics. It covers the entire spectrum of viral hepatitis and has something of interest for every specialist. Viral Hepatitis presents the latest thinking from the leading international researchers and clinicians working in this field and the Editors are joined by a North American co-Editor for this edition - Professor Stanley Lemon of the University of Texas, Galveston, TX, USA. This book offers an ideal reference for all healthcare professionals involved in the research and patient care of this disease. 1. Liver stem cells in persistent viral infection, liver regeneration and Cancer. 2. The role of the liver in the immune response. 3. Clinical Features of Hepatitis. 5. Evolution of hepatitis viruses. Section III - Hepatitis A Virus . 6. Structure and Molecular Virology. 8. Natural History and Experimental Models. Section IV - Hepadnaviridae . 10. Structure and Molecular Virology. 11. Epidemiology of Hepatitis B. 14. Molecular Variants of Hepatitis B Virus - surface antigen. 15. Molecular Variants of Hepatitis B Virus - core antigen. 16. Natural History of Chronic Hepatitis B and Hepatocellular Carcinoma. 17. Hepatocellular Carcinoma: Molecular Aspects in hepatitis B. 18. Pathogenesis of Chronic Hepatitis B - animal studies. 19. Pathogenesis of Chronic Hepatitis B - human studies. 20. Treatment of Chronic Hepatitis B. 21. Management of drug resistant variants. 22. Liver Transplantation in the Management of Chronic Viral Hepatitis. 23. Protection against hepatitis B. SECTION V: Hepatitis C Virus. 24. Structure and Molecular Virology. 26. Immune response to HCV in acute & chronic infection. 27. Chimpanzee model of HCV. 28. Autoimmune disorders associated with hepatitis C.
29. CNS complication of HCV infection. 30. In vitro replication models of HCV. 31. Small animal models of Hepatitis C.
32. Progression of Hepatitis C.
33. Natural History of Chronic Hepatitis C and Hepatocellular Carcinoma. 34. Treatment of Chronic Hepatitis C.
35. New drugs for management of hepatitis C.
36. Prevention of hepatitis C.
Section VI - Hepatitis D Virus. 37. Structure and Molecular Virology. 39. Treatment of Hepatitis D.
Section VII - Hepatitis E Virus. 40. Structure and Molecular biology. 41. Hepatitis E as a Zoonotic Disease. 42. Epidemiology, Natural History and Experimental Models Diagnosis -. Section VIII - Clinical Aspects of Viral Liver Disease. 44. Etiology of Fulminant Hepatitis. 45. Treatment of Fulminant Hepatitis. 48. Occupational Aspects of Hepatitis. 49. Neonatal and Pediatric Infection. 50. Management of Hepatocellular Carcinoma. 51. Application of Molecular Biology to the Diagnosis of Viral Hepatitis. 52. Hepatitis in HIV-infected Persons. 53. Treatment of extra-hepatic diseases caused by HBV & HCV. 54. The Histologist's Role in Diagnosis and Management of Chronic Hepatitis B & C.
56. Mechanisms of interferon resistance. 57. Novel cytokines for all hepatitis. 58. New in vitro testing systems. 59. New vaccine technology (oral vaccines/adjuvants). 60. Safety of hepatitis vaccines. "This is a new edition which is a real milestone for hepatologists. This book represents a hige and successful effort to highlight several aspects of viral hepatitis, through the contributions of the main experts in the field, also including some promising approaches such as hepatic stem cell biology. This is an extremely useful instrument providing a wide range of information [...] which can help us to imporve our management of patients with viral hepatitis." "This books covers the enitre spectrum of viral hepatitis and has something of interest for every specialist...the topics are refreshingly current and include most of the latest literature...I strongly recommend the book to scientists involved in research and patient care of viral hepatitis."